“We know more than we can use. Look at all this stuff I’ve got in my head: rockets and Venetian churches, David Bowie and Diderot, nuoc mam and Big Macs, sunglasses and orgasms. How many newspapers and magazines do you read? For me, they’re what candy of Quããludes or scream therapy are for my neighbours. I get my daily ration from the bilious Lincoln Brigade veteran who runs a tobacco shop on 110th street, not from the blind newsagent in the wooden pillbox on Broadway, who’s nearer my apartment. 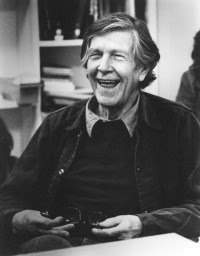 The avant garde composer, John Cage, received a 25 year retrospective at the town hall in New York in 1958, the same year he was invited to Milan. He spent four months over the summer here, working on a piece called “Fontana Mix” and doing something really quite strange, even for the “Betwixt” panoply. Reunited here with a once-estranged Peggy Guggenheim (who is coming shortly, of course) he also became a contestant on a television quiz show called “Lascia O Raddoppia” – that’s “Double or Nothing” to you and me. His topic was mushrooms. And for five weeks he was undefeated: earning a tidy $6000. Not bad for 1958.